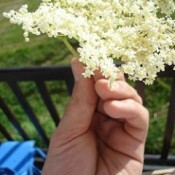 Elderflower CordialThis is a recipe for a frugal foodie cordial which although it is made with the flowers of a plant found in many hedgerows and river banks is sold in high end retailers for a lot of money. Lentil-Rice PilafSaute lentils, rice, onions, and mushrooms in butter until onions are golden. Add thyme and chicken broth. Bring to a boil, reduce heat, cover, and simmer 30 minutes until tender. Refrigerator PicklesThis keeps a long time and is very easy to fix. Pack onions and cucumbers in a gallon jar. Mix rest of ingredients until sugar and salt is dissolved and pour over cucumbers and onions in jar. Classic LemonadeJust in time for the 4th of July and all other summer celebrations for that matter. Nothing is better than homemade! Raspberry SaladMix pretzels, butter and 2 Tbsp. sugar. Spread in 9x13 pan. Bake at 350 degrees F for 10 minutes and cool. Dissolve gelatin in hot water, add raspberries, and put on top of cooled crust. Honey RollsStir the butter and honey into the hot scalded milk and stir until the butter melts. Cool only until lukewarm. Dissolve the yeast in the warm water and add to the cooled milk mixture along with the salt and 2 cups of the flour. GoulashCook onion and celery in margarine until tender. Add ground beef. Add salt, pepper and oregano. Brown meat and drain. Boil noodles in 2 qts. of lightly salted water for 8 minutes. Creamy Tang PieSimple to make. Cool, creamy, and light - perfect for summer desserts. Makes 2 pies. Can be made ahead and frozen. Little Smokie PocketsSmash each biscuit to a circle about 5-6 inches. Spread 1 scant tablespoon barbecue sauce in center, slice the little smokies in half lengthwise and place one half in the center, top with one tablespoon of the cheese. Present CenterpieceFor my high school reunion, I made a centerpiece using a few stacked "presents" wrapped in graduation-themed paper and ribbon in our school colors. My presents were empty, but you could put anything you want in them, especially if the party is for an individual. Don't Leave Clothes Outside OvernightI have found that leaving your clothes on the line over night causes them to smell funny. I think it's because of the dew. It might depend on what part of the country you live in whether or not they don't smell from the dew. 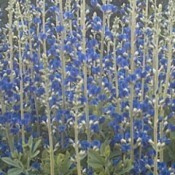 Garden: BaptisiaBaptisia, or False Indigo, contributes beautiful spring color. It is a shrubby perennial that needs to be cut back in fall or early spring. The seed pods turn solid black and rattle in the south wind. It is so very blue - I wish it could bloom all summer! 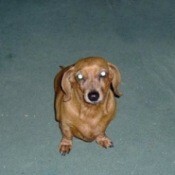 Pixie (Mini Dachshund)Pixie is a 12 year old Mini Dachshund. My husband bought her at 8 weeks old. She plays with toys, and likes to go for ice cream. 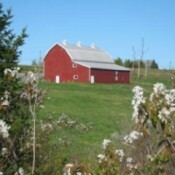 Red Barn (Nova Scotia, Canada)This red barn is framed by wild pear blossoms. It is located at the Cole Harbour Heritage Farm walking trails near my home in Nova Scotia, Canada. Bring Snacks When You TravelEvery summer we make a 1000 mile (one way) drive back home to visit family. I always end up doing last minute shopping and spending too much money to buy snacks for travel, until this year! Use Google For Missing ManualsIf you go to google and type in the company name, then model, and the word "manual", it will usually give you links to the company, the manual, etc. Most are general manuals for the same company and will work no matter what the model number is. Buy Loose Mushrooms Instead of Pre-PackagedI buy loose white mushrooms by the pound instead of the pre- packaged ones. They are bigger, plumper and fresher. They do cost a little more but I get a 1/2 lb. which is usually the cost of the packaged 10 oz. mushrooms. Lacey (Rottie/Chow Mix)Lacey is a 9 year old Rottie/Chow mix. I got her for Christmas from my son. She likes to go to the beach and chase the fishes. 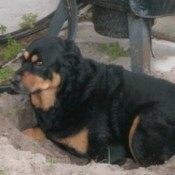 She loves to dig holes and lay in them to get cool. Keeping Drains ClearI dump my used coffee grounds in the sink drain and follow with water. It's almost like sand blasting the pipes. I have never had drains plugged up because of it. Everyone in my family who has his or her own kitchen does it with no ill effect. Use Dog Poop Bags for DiapersNow that I am through with diapers, I will share one tip. I couldn't always run stinky diapers to the trash outside, so I bought doggy poop bags (the kind you take with you on a walk to clean up after your dog). Use Glass Pudding Cups to Make MuffinsI've been buying blueberries on sale each week and baking two dozen wholewheat blueberry muffins. My husband and I have a bowl of cereal each morning and then enjoy a blueberry muffin along with our coffee. 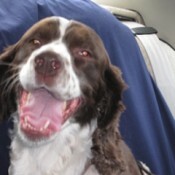 Sammy (Springer Spaniel)Sammy will be 7 on July 16th. She is a Springer Spaniel. I got Sammy 6 1/2 years ago, from a family that could not keep her because they were moving. Make Bible Cover from Old PurseI had a crocheted cord purse that had a hole in it. I tried to repair it, but it just didn't look the same. 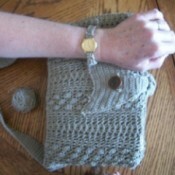 I decided it was a pretty pattern, so I made two things from the purse and had some leftover cording which I wound up in a ball for other miscellaneous uses later. Toast Shredded CoconutIf your shredded coconut dries out too much for certain recipes you normally would use it for, simply toast it on a baking sheet in a moderately heated oven, turning occasionally so it will brown evenly. 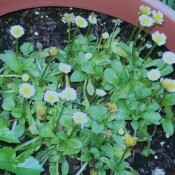 Use Boiling Water to Kill WeedsA great, thrifty, non-toxic, and environmentally friendly way to rid spaces of weeds is to simply pour boiling water on them. I use my electric tea kettle and bring some water to a boil. Then I go out and pour the boiling water on any weeds I want to get rid of. Garden: English DaisiesThis is the first year I have discovered the English Daisies. They are so small, dainty and petite, just adorable. They did take me a while to learn how to care for them. They are so cute and also come in pinks and reds. I love these little flowers! Iron Over a PillowNo ironing board or room for one? Iron your clothes over small square or round pillows. Placing the fabric over the pillows to iron is perfect for corners and hard to reach spots that need stretching out. Sparrow for TeaOne day, a sparrow stopped by to see if my garden restaurant would be serving up any bug and meal worm tea. 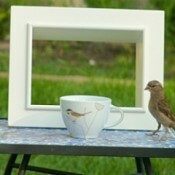 I like to set up scenarios in my garden and then wait to see if I can capture a photo of any curious birds that happen by! These are a couple of my favorites! Independence Day WreathCelebrate the 4th of July by showing how Patriotic you are with this beautiful easy to make Patriotic wreath. 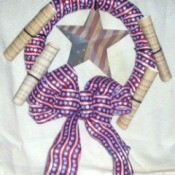 Begin by wrapping the foam wreath with one roll of the red white and blue ribbon. Tape the edges to keep it secure. 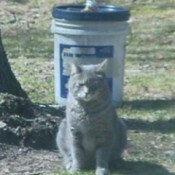 Funny: Protecting The Oil SupplyThis is a bucket of oil for a firepit and the cat just happened to be at the right place at the right time. I just heard about the oil spill that morning and it looks as if he is protecting that oil from a spill. Use Bubble Wrap To Increase Tub's Water LevelI love long hot baths, but even though I have an older and roomier bathtub the valve around the faucet still drains off the water and lowers the water level. I have found that I can stop up that drain by stopping it with squares of bubble wrap. 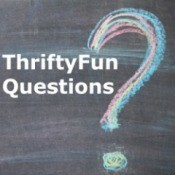 My Frugal Life: Trial And ErrorI have learned so much. I have made a few mistakes that have changed the way I do things; in the kitchen and elsewhere throughout our home. 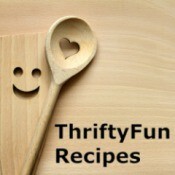 I really enjoy this newsletter, it is so fun and has saved me lots of money when I needed it! Make Own Ice Block for CampingFor ice when camping, grocery shopping, etc. Use as many jugs as necessary for your time frame. 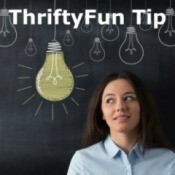 If you need ice for a long time, freeze 1 gallon water/juice/cleaned milk jugs filled with potable water. Use Vinyl Tablecloth as Curtain to Keep Out HeatI took a cheap vinyl flannel-backed tablecloth, cut small holes and thread it through the curtain rod on our back door and small back window. It worked! 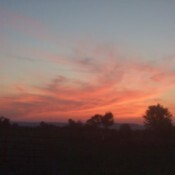 Scenery: Sunset (Arkansas)Driving home one night I captured this. Of course, the picture can't come close to the real beauty of it. We are often blessed with sunsets like these. Recipe for Thai Coconut Sticky RiceA friend from Thailand some years back made a sweet rice dish that was wonderful. I know she used coconut milk in it, but does anyone know how to make the rice dish? I think it was kind of sticky, too. Macaroni and Cheese Too DryWhy is my macaroni and cheese so dry? I mix 3 tablespoons of flour and 1 stick of butter in a saucepan and let it melt. Then I add 1.5 cans Carnation milk, 2 cups cheese, and 1-8oz package of cream cheese, stir and add to macaroni. Please tell me what I am doing wrong. Dog is Afraid of WindMy dog is petrified of wind, it's not the sound of it, but the feel of it. Any ideas on what I can do? Steel Wool Left Stains on Wood TableI am refinishing a dining room table, using a stain remover to lift the stain. The directions called for steel wool, but the steel wool has left dark black stains on the wood. Does any one have a remedy for removing the black stains? Centerpiece for Ladies Night Out - Superwomen ThemeWe are having a Ladies Night Out at our church and the theme is "Superwomen". I need some ideas for centerpieces for the tables. 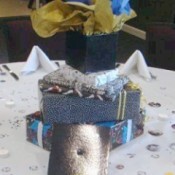 We will have about 20 tables and the decorations will need to be cost effective. Puppy Has Soft StoolI've had my pit bull puppy for about 3 weeks now. He's going on 3 months old. Ever since I got him, I've fed him adult food (small dry food). Why isn't his poop dry? People have told me that it is because he needs puppy food. Is that true? Removing Denim Dye from White ClothesHow do you take blue jean dye out of white shirts? Reviews of Medex Grey/Gray Away ShampooI just wondered if anyone has bought and tried Medex "Go Away Grey" hair shampoo. Apparently it's supposed to get rid of your grey hair and bring it back to your original colour. I want to buy this product, but before I do I want to read any reviews. Thanks. Removing Screen Print Logo on Flour BagsI would like to know how to get rid paint markings on flour bags? Removing Nicotine and Smoke Stains from LeatherWhat kind of cleaning solution or home remedy can I use to remove nicotine and cigarette smoke stains from leather? Buying Sunglasses in BulkI'm looking for cheap sunglasses with wide sides that can be embellished with flat sparkly beads. I've had trouble finding sunglasses that I can buy in bulk at a reasonable price. Is It Safe to Use Expired Toothpaste?I need some advise, please. Recently, I came across a stash of toothpaste when I was cleaning out a cupboard. They are all new, all sealed, and I started to use them.